Intimate kissing—the kind where saliva is exchanged—is a courtship staple unique to us humans and very common in most world cultures. In the midst of sharing an intimate smooch you’re probably not thinking about what’s happening inside your mouth or of your beloved’s. As “unsexy” as it sounds, our mouths do contain a thriving microbiome. Microbes are key role players in gene expression, diet, age, and yes—even sexual behavior. 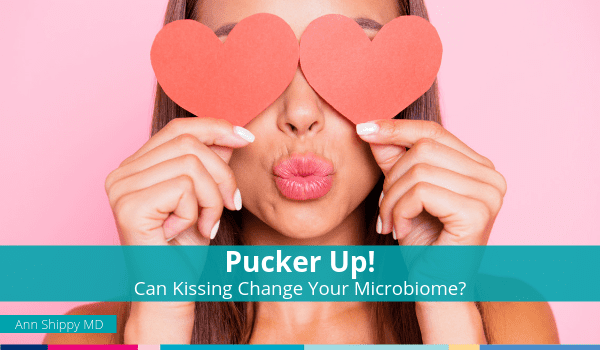 In a study in the journal Microbiome, Dutch researchers observed how bacteria are exchanged between partners during an intimate kiss. Twenty-one couples, ages 17 to 45, agreed to have their mouths swabbed before and after kissing. One partner was given a probiotic yogurt, and then the couples smooched. Researchers identified an uptick of Lactobacillus and Bifidobacterium in the partner who hadn’t taken the probiotic— up to 0.54 percent in saliva and 0.49 percent on the tongue. The exchange corresponds to an average of 80 million bacteria transferred per French kiss. Kissing contributes to the attachment we develop with a beloved. It arouses us with sensory explosion. Adrenaline gets pumped to the heart. Your brain shuts down negative emotion and those happy brain chemicals surge.